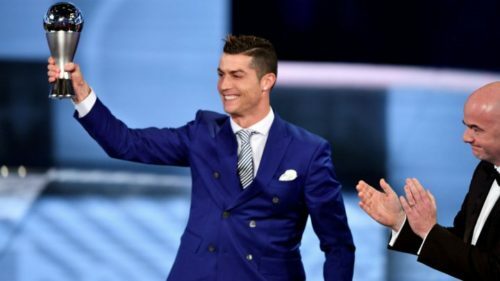 WELCOME TO ELITISM6.COM: Cristiano Ronaldo shades Messi and Barca after winning FIFA Player of the year. Cristiano Ronaldo shades Messi and Barca after winning FIFA Player of the year. The Portuguese striker, crowned the Best FIFA Men's Player of the Year for 2016, directed a curious remark towards Barcelona during the ceremony. An excited Ronaldo gracefully walked to the stage to receive his award while he trolled 'some people from Barcelona'.